Adidas has been taking the sneaker world by storm ever since it introduced the “Boost” technology and things have never been the same since then. Kanye, Pharell, Stella McCartney, and many other celebrities have had successful lines using the said technology and guess who’s next on the list? How about Son Goku? That’s right folks, the widely famous Goku is receiving an Adidas makeover with the Dragonball Collection that’s set to hit stores later this year! 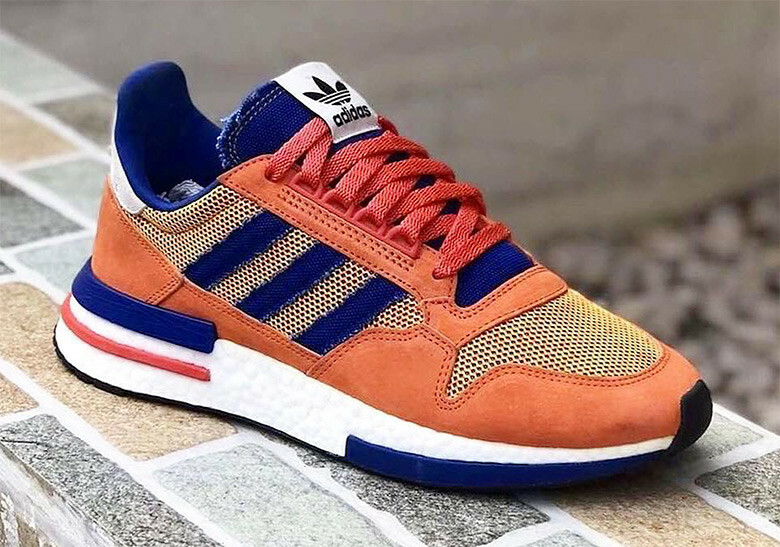 All we’ve seen are mock ups so far but now we finally have a clean look at the ZX 500 RM “Son Goku”, check it out below! This is the best look of the upcoming model by far, where the shoe takes on the iconic orange and blue colors of Goku on top of the yellow mesh, with red and blue panel accents on the patented Adidas boost technology. The ZX 500 silhouette has been around for over 20 years now but may now see a big resurgence thanks to the chunky sneaker trend hitting sneakerland so keep a look out for these kicks that are sure to leave a massive broly-sized hole in your wallet when the Adidas x Dragonball collection drops sometime in August!